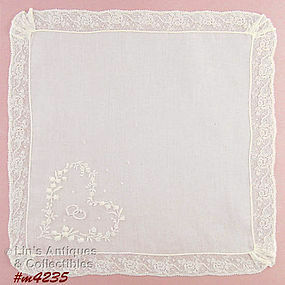 Another beautiful white wedding handkerchief! It measures 11 ½” x 11 ½” and is in excellent condition. 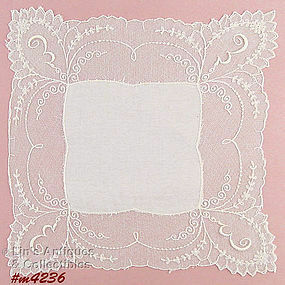 Exquisite white Madeira wedding handkerchief! It measures 11 ¼” x 11 ½” and is in excellent condition. 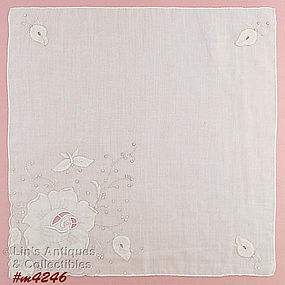 Beautiful and delicate wedding handkerchief! It measures 11” x 11 ¼” and is in excellent condition. 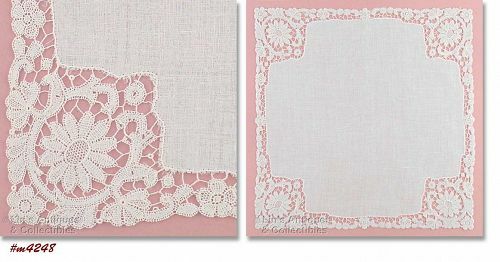 This listing has two exquisite white linen handkerchiefs! 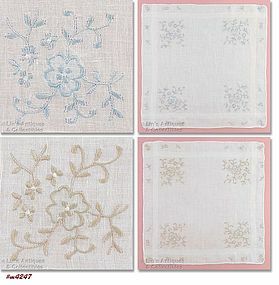 One has blue embroidery, the other has beige, measure 12” x 11 ¾”, and are in excellent condition. Beautiful! This white Madeira hanky has a white rose with a white butterfly and white leaves accented with white embroidery satin stitch. There is a single white rosebud in three corners and in addition, the rose and each rosebud have “cut-outs”. 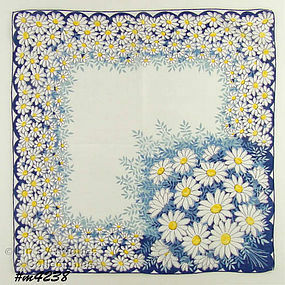 Handkerchief measures 15” x 15” and is in excellent condition. 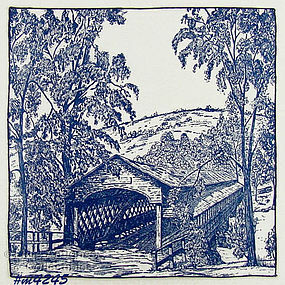 Another unusual hanky – a covered bridge! Hanky measures 12 ½” x 12 ¾” and is in excellent condition. 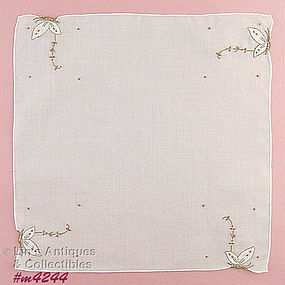 Beautiful white Madeira hanky with 4 butterflies! Hanky measures 11 ¾” x 11 ¾” and is in excellent condition. Wow – this is a lovely hanky – it has purple violets and lily of the valley! 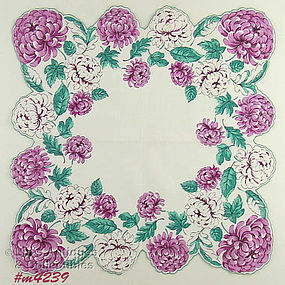 Handkerchief has scalloped edge, measures 13 ¼” x 13 ½”, and is in excellent condition. 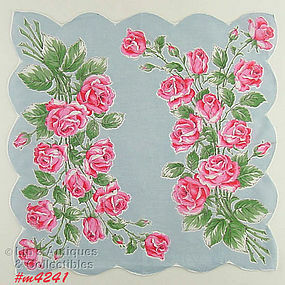 Beautiful hanky with pink and white roses! Hanky measures 16” 16 ¼” and is in excellent condition. This is one of the prettiest hankies in our inventory! It has 2 large bouquets of pink roses, measures 15 ¾” x 16 ¼”, and is in excellent condition. 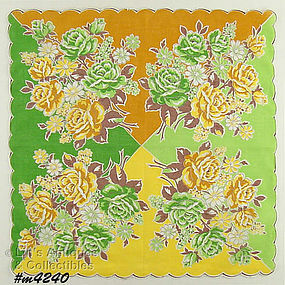 This listing has a beautiful and very unusual color scheme hanky – it has beige and green roses! Hanky measures 15 ¾” x 16” and is in excellent condition. Another larger size and beautiful hanky! It has large purple and white asters, measures 16” x 16”, and is in excellent condition. Super! This listing has a very colorful hanky with lots and lots of daisies! Hanky measures 15 ¾” x 16” and is in excellent condition. 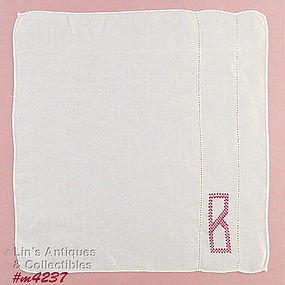 This listing has a lovely white handkerchief with cross-stitched “B” monogram! It measures 10 ¾” x 11” and is in excellent condition. Absolutely beautiful monogrammed handkerchief! It’s white with white lace and each corner has a white monogram “E”. Hanky measures 10 ¾” x 11” and is in excellent condition. 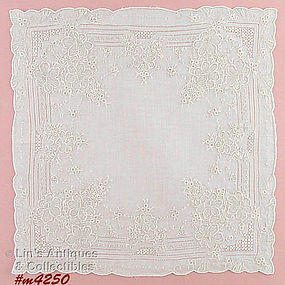 Absolutely beautiful white wedding handkerchief! 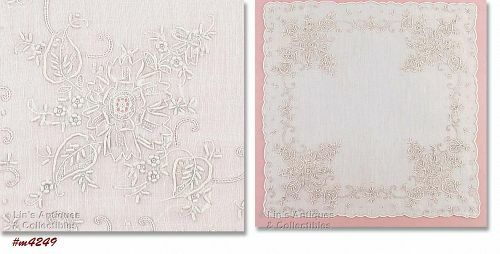 It measures 13 ¾” x 14”, has lace edging, and one corner has an embroidered heart with entwined rings in the center. Excellent condition. 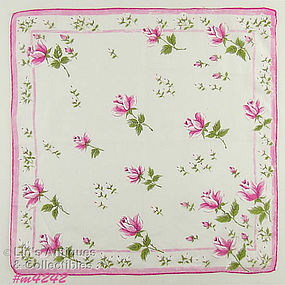 Another beautiful Madeira “M” monogrammed hanky! This one is done in beige, measures 15 ½” x 14 ¾”, and is in excellent condition. Beautiful Madeira blue monogram “M” hanky! Measures 15 ½” x 14 ¾” and is in excellent condition.